Here's the problem with cooking: it ruins things. I don't mean the cup or two of almonds that I left under the broiler too long and toasted way past the point of being edible, and I don't mean the oven mitt that inadvertently got pressed up against--and badly seared by--the heating element when I tried to retrieve my oven thermometer from under the lower rack. (I guess it's not actually ruined, just battle-scarred.) I mean that after cooking something yourself, it can be awfully disappointing when you go back to the often-mediocre purchased version. My brother and sisters and I received an early introduction to this concept: pies, pancakes, and jam, among other foods, were all ruined for us at an early age. There's just no comparison between homemade strawberry jam and most of the jams and jam-like products you can buy at a grocery store. (Farmer's markets are typically a different story, but when I was growing up they weren't as commonplace in the Bay Area as they are now.) Over the years, food after food has fallen into the "ruined" category: applesauce, cupcakes, pastry cream*, cranberry sauce, and the latest: marshmallows. This week I am at yet another conference (which is, thank goodness, the last I'll be attending this summer). The first evening, after the student day, there was a dinner followed by a fire for marshmallow toasting. Excellent, right? I haven't toasted marshmallows in years, and I'm long overdue for a beautifully golden, crisp-and-gooey, watch-your-tongue-or-you'll-burn-it marshmallow. But... meh. I couldn't help feeling a little less enthusiasm than I ordinarily would for toasted marshmallows, and it's all my own fault. Or, if I feel like pointing fingers, it's all Deb's fault. You see, way back in June, Deb put up a post on marshmallows. Deb posts delicious-looking things on a regular basis, and normally it's not a problem, but this particular post went up in the middle of a prolonged cooking drought at the Beyond Ramen household. For nearly all of June, I hardly even set foot in the kitchen. For the first couple of weeks, I was spending nearly every waking moment at work trying to get some results for a conference. Then I was away in Boulder attending said conference, and then I came home for all of 36 hectic hours before heading off to Scotland for yet another conference. Seriously, folks, I went through withdrawal. I thought about food. I thought about my kitchen. I thought--I schemed--about what I would make when I got back to my kitchen and had time to cook. I thought about how I would photograph what I was going to cook. I bought the latest issues of Gourmet and La Cucina Italiana to try to get a fix, and ended up with even more ideas for what to cook. I wrote extensive notes so that I could preserve those ideas for when I got home. 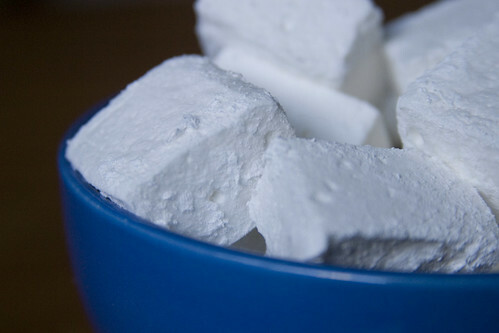 Given my state of mind, Deb's marshmallows were the perfect (or worst) thing for scratching that itch of mine. They were different. They were fun. They were unexpected, not the sort of thing that one often considers making at home. 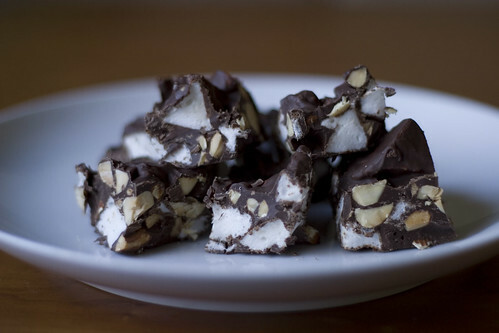 They had the potential to be turned into more fun and different and unexpected things--like homemade rocky road. Naturally, when I finally did make it home, they were among the first things I made. And as is so often the case when you make something at home that you've always purchased ready-made, they were reminiscent of the purchased version, but so much better. Who knew that marshmallows could actually be moist? Not I. Moist, light, delicate, and resiliently springy... only distantly related to their rather tough, easily squished store-bought counterparts. They sort of make me think of a strange hybrid between ordinary marshmallows and jello. These marshmallows bounce. Back at the conference and the not-quite-bonfire, it turned out that the marshmallows were a moot point: there was a pickup volleyball game going on, and I am drawn to volleyball like the Millennium Falcon caught in the Death Star's tractor beam. Fire and toasted marshmallows were quickly forgotten, and I was spared the potential disappointment of uninspiring marshmallows. I'm not saying that I'm so much of a snob that I'll never eat grocery store marshmallows again. I'll eat them, and even enjoy them. But I'll know what I'm missing. UPDATE: In my typing haste, I neglected to include two items (granulated sugar and salt) in the list of ingredients. My apologies! The recipe should be correct now. Grease the bottom and sides of a 13x9-inch pan, or a pan (pans) of equivalent volume, and dust with confectioner's sugar. Pour 1/2 cup of the cold water into a large bowl. Sprinkle the gelatin over the water, and let it stand to soften. In a medium heavy saucepan, combine the granulated sugar, corn syrup, remaining 1/2 cup of cold water, and salt. Cook over low heat, stirring frequently with a wooden spoon, until the sugar has dissolved. Turn the heat up to medium, and affix a candy thermometer to the side of the pan. Boil the mixture, without stirring, until it hits 240F/115C, about 12 minutes. Remove the pan from the heat, and combine the sugar mixture with the gelatin mixture. Whisk until the gelatin has dissolved. Using an electric mixer (or a whisk if you're feeling vigorous), beat the mixture on high speed until it is thick, white, and has almost tripled in volume. This will take at least 10 minutes with a hand-held mixer and 6 minutes with a stand mixer. Set the whipped gelatin mixture aside, and clean the beaters thoroughly. In a separate small or medium bowl, beat the egg whites until they barely hold stiff peaks. Beat the whites and the vanilla into the gelatin mixture until everything is just combined. The mixture should be thick, shiny, and very sticky. Pour the marshmallow mixture into your prepared pan. Beware the urge to get every last bit of it out of the bowl, unless you're very adept with your spatula and are willing to run the risk of getting strings of marshmallow goop everywhere. Sift a nice, even layer of confectioner's sugar over the top, and chill the marshmallows until they're firm and springy. This will probably take at least three hours, but you can leave the pan in there overnight if you like. When you're ready to cut the marshmallows, run a thin knife around the pan's edges. Use your fingers to loosen the marshmallow block--gently, now--from the pan. You can either invert it onto a cutting board, or if you're feeling brave you can just pick up the marshmallow block and place it onto the cutting board. Use a large knife (or a pizza cutter, or cookie cutters) to cut the marshmallow into the desired shapes. Oil your cutting implement if you have problems with stickage. Sift the remaining confectioner's sugar into a bowl, or into the now-empty pan, and roll the cut marshmallows in the sugar to coat the cut edges. 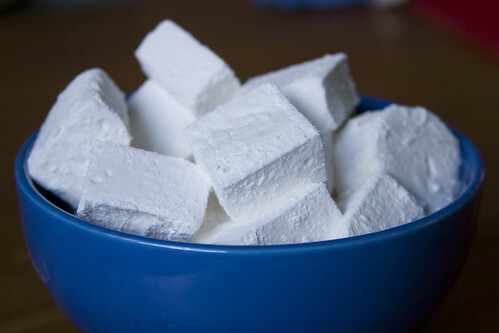 Shake off the excess sugar before storing the marshmallows in an airtight container. The original recipe says the marshmallows keep for one week, but mine lasted a lot longer. I haven't yet used these marshmallows for s'mores, but I can tell you that they make excellent homemade rocky road. * This is a continual source of annoyance for me. What is it with some folks' apparent inability to cook a pastry cream properly so that it isn't chalky? I'm not a big fan of marshmallows (but maybe it's because I've never tried these?). They do look tempting, particularly in their rocky road incarnation. What a charming essay, and I know EXACTLY what you mean. My mother was such a good "scratch" cook and it has made me such an intolerant eater!! If you don't care for marshmallows, I wouldn't make a batch of these just to see if you like this kind. They're enough like normal marshmallows that you might still dislike them. That said, if you're making some anyway, it might be fun to give one a try. And I have to say, there's something very satisfying about making a classic confection like marshmallows at home. I had a feeling that you were a kindred spirit in this respect! I feel like such a food snob sometimes, but at the same time, I wouldn't have it any other way. I bet your girls are getting a good grounding in excellent from-scratch cooking, too! I hope that Camille likes the cupcakes! Is it her birthday, or is she having friends over just for fun? I'm not a huge fan of marshmallows, but I could definitely go for some of that rocky road fudge!